For someone who never grew up with pets and never wanted any, I flipped the switch to crazy cat lady with an ease I’ll never understand. Within a year’s time I went from zero cats to three cats and if I had space, I’d have a house full of them. One came to us as a “free kitten to good home,” and the other two were rescued momma cats. I have a soft spot for mommas because once their kittens are adopted, they’re left behind and have a tougher time finding homes. I love “my girls” with all of my heart and consider them part of the family. I’d pretty much do anything for them, which is why I started making DIY cat toys. It’s all part of my plan to help the cats be active, have fun, stay healthy and eat well. 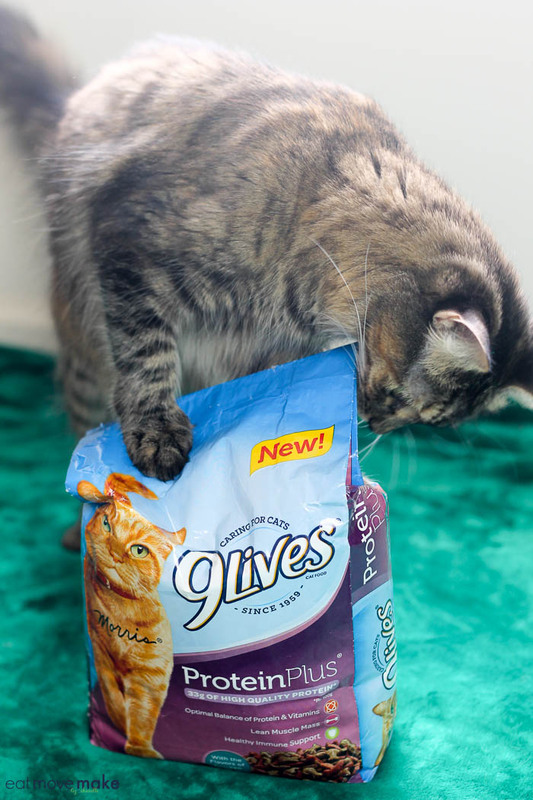 Speaking of eating, if you think Morris the Cat is the only one who’s got mad love for 9Lives, you should see my cats go to town on a bowl of 9Lives Protein Plus. 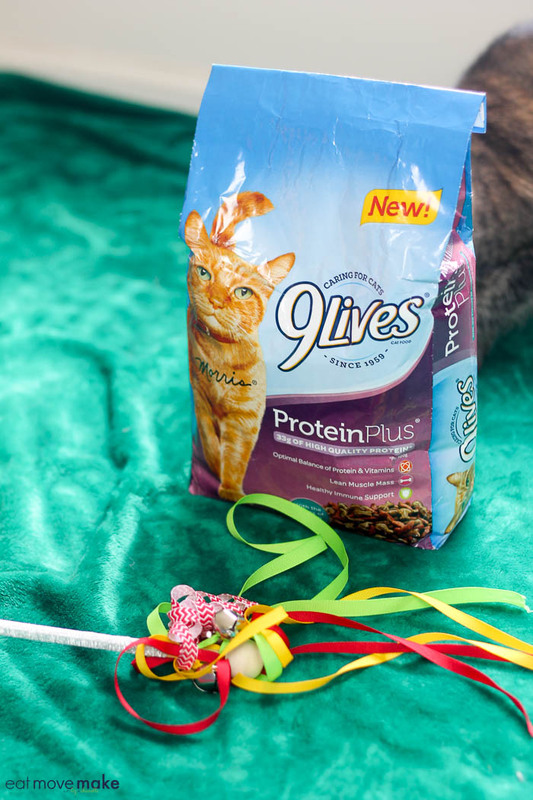 My cats are sassy but not snarky, fun but not boring… just like Morris, so it’s no wonder they love the wholesome, tasty ingredients in 9Lives Protein Plus as much as they do. They can’t get enough of the delicious flavors of chicken and tuna! They barely pick their heads up out of the bowl while chomping. 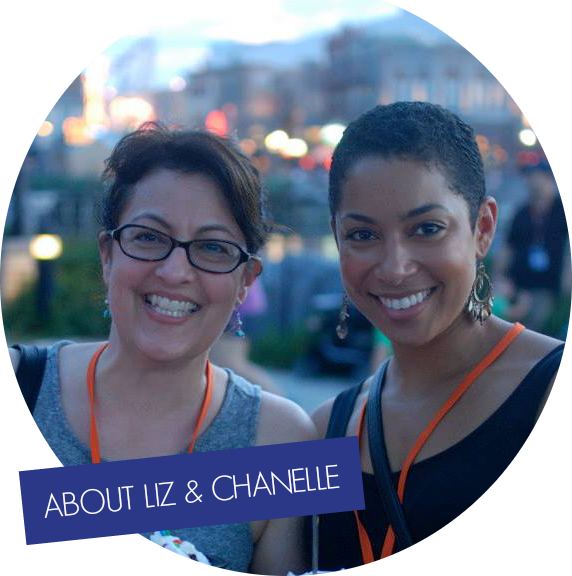 It makes me happy to know they enjoy their food so much, and I feel reassured I’m making a responsible food choice that offers them the taste, nutrition, and variety they crave. 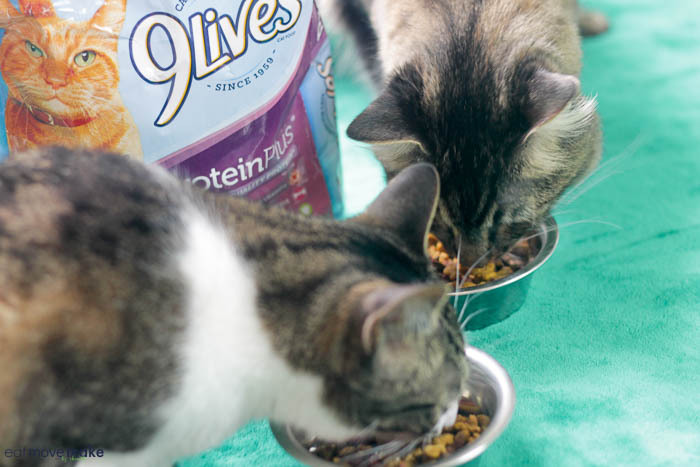 But even more important to me is that 9Lives Protein Plus is packed with 100% complete and balanced nutrition for adult cats filled with antioxidants for healthy immune support. It also has 33 grams of high quality protein (per 100g of food) to help support lean muscles and provide energy. And since my cats love to play, run and climb, I want their food to give them all the energy they need for playtime. 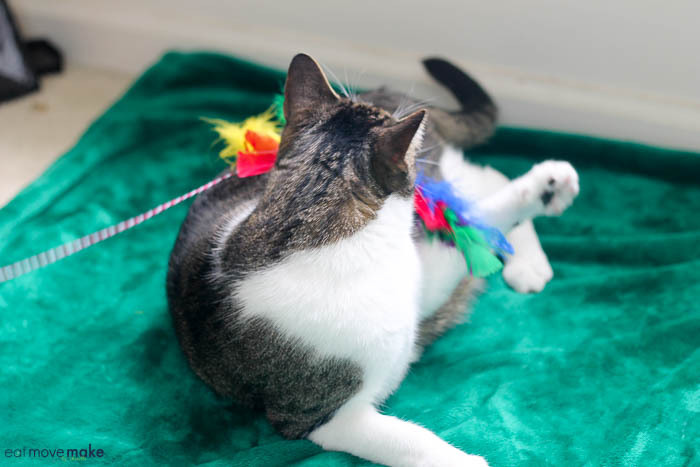 If your cats love to play as much as mine do, try making some DIY cat toys! My cats patiently watched me the entire time I was making the toys and couldn’t wait to get their little paws on everything. You’ll need some wooden dowels, dowel caps and a bunch of embellishments. Go with whatever strikes your fancy or your cat’s fancy. 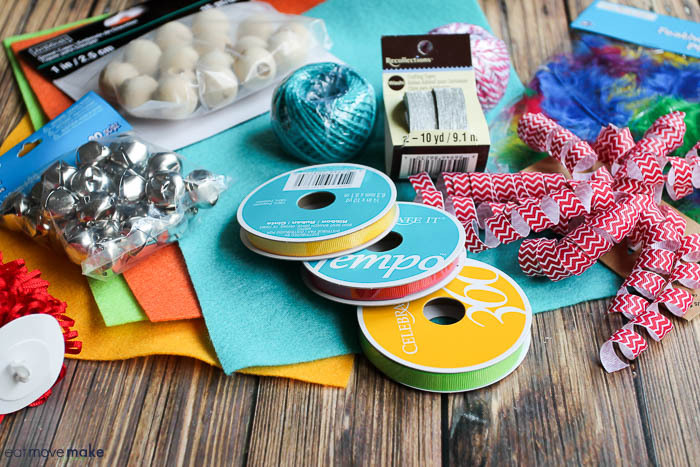 I bought ribbon, twine, bells, feathers, felt and washi tape. I cut the dowels to 18″ lengths and then just randomly started crafting. 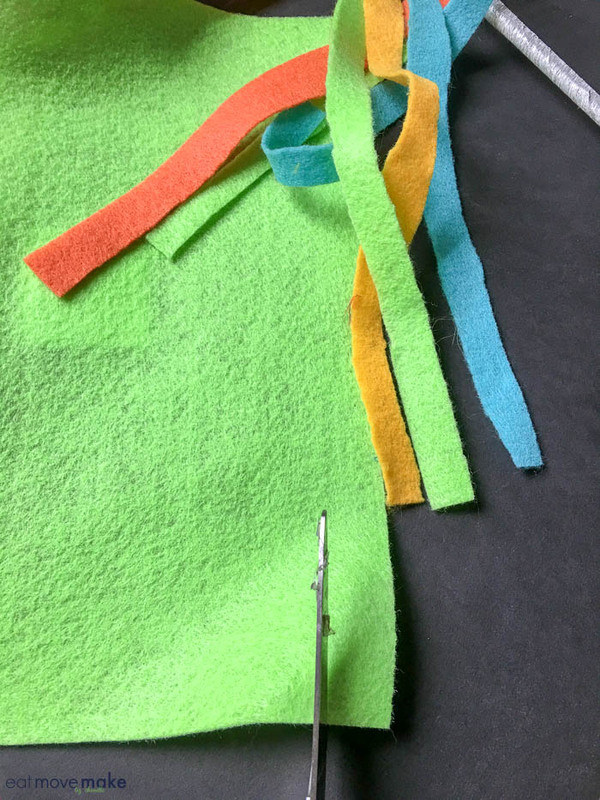 For one DIY cat toy, I cut strips of felt, then attached them to the end of a dowel with twine and a few bells. 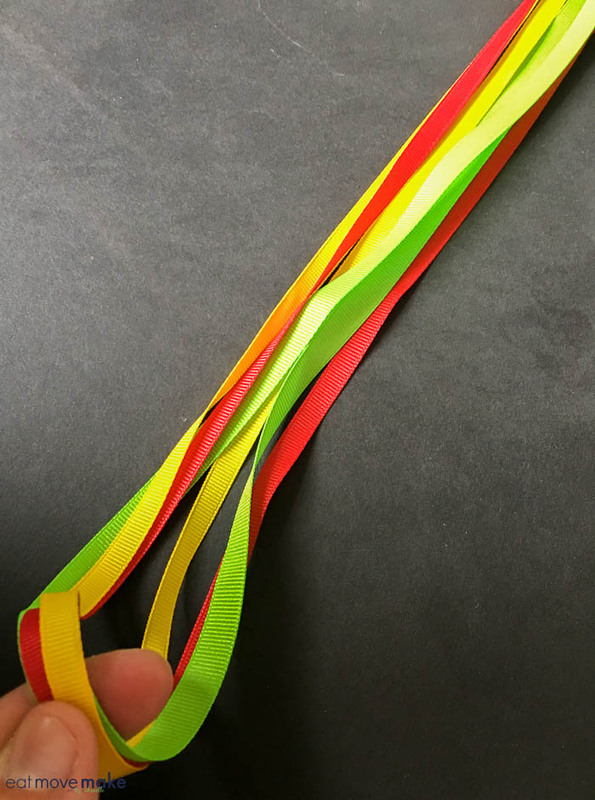 For another one, I cut long lengths of ribbon. And then I added some curly-q ribbon and a few bells. 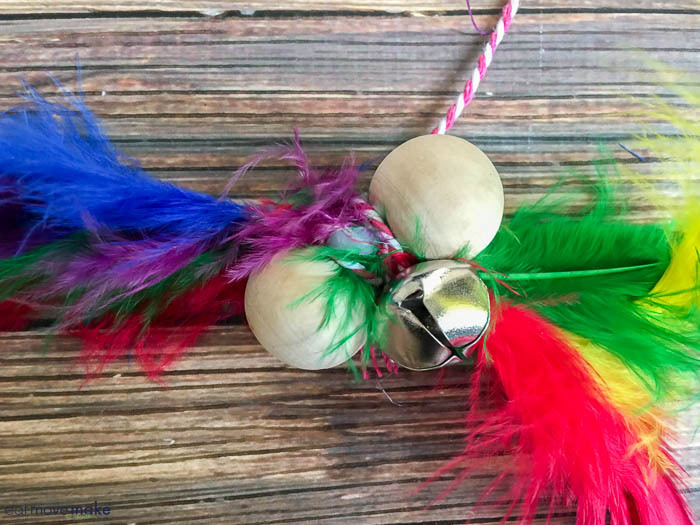 To make a dangling feather cat toy, I cut a 1-inch section off of the dowel and glued two caps on the ends, then attached feathers, a bell and tied it to the dowel with some twine. Finally, I wrapped washi tape around the dowels for some extra sparkle. I wrapped twine around one of them too, but washi tape was much easier! And the cats love them! 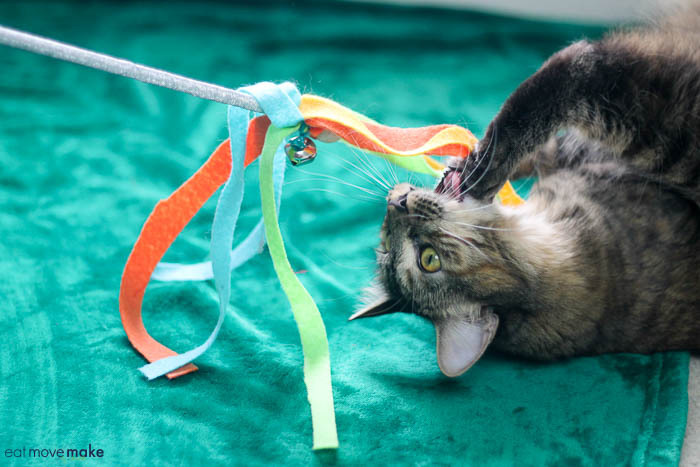 I hope you’ll try making these fun DIY cat toys for your cats too. They’ll get a huge kick out of them, and you’ll be helping keep them active and happy. And be sure to pick up some 9Lives Protein Plus! You can use this $1.00 off ibotta deal when you purchase it at Walmart. Thank you so much for sharing these DIY cat toys! We have 4 fur babies and buying them cat toys can be pretty expensive. I cannot wait to make some of these for them! I will certainly need to make these. I recently rescued an abandoned kitty and she loves to play with her toys! I like to keep her entertained and this should do the trick. I have not noticed this brand of cat food in the store, but I will have to look for it the next time I shop. It does look like a really good brand to keep my fur balls happy, healthy and active. I’ll try my best to make toys for them too. These are really cute DIY cat toys. I mean, it looks better than those at the store! I think I may be able to make this myself. Thanks for the idea. My cats would love this. If I had a cat, I would totally make these. I love making my dog DIY toys and things. I need to pass this along to a “cat” friend. She’s so crafty so I’m sure she will try these. I can’t wait to make some of these cat toys for my girl. Your babies are beautiful. My cat loves anything that moves, especially my bare feet. What an adorable idea. I really love DIY crafts because It’s cheaper and affordable. I will make one to my persian cat, they will definitely love it. My brother loves cats and has 2! He would get a kick out of this! I love how colorful these are! I could easily have a house full of cats myself! We currently have four and they would love this cat toy! Thanks for the tutorial. It looks like your kitties love 9Lives Protein Plus as much as mine do. They chowed down! I honestly feel if you create toys for your pets they last longer. Our toys love the t-shirt toys we made and won’t really play with anything else. Great ideas! This is a really cute idea! I will make one for my cat! We only have one cat at home and we love him to pieces! I think it’s awesome to make toys for him to play with! These are all lovely ideas! OMG now isnt this precious??! I love the DIY on these kitty toys so colorful and bright I think cats would enjoy this! These are fun projects to do for your fur babies. We don’t have cats but we do similar things for our dogs. That’s such a great idea. The kids would love helping me make these cat toys. We don’t actually have a cat, but the neighbor next door has been adopted by zillions. what a cutie fur babies you have!! Thanks for sharing this, i can make one for my Shih Tzu and can also give as gift to my friends who has fur babies too! Your cats are cuties! I too would have a house full if I could. My cats would love these toys, they look better than some that you see in the stores. Aww what a cute kitty! Looks like your kitty loved the cat toy. So creative! How fun for your cats! It looks like they are loving their new toys and food! Your cats are so cute! 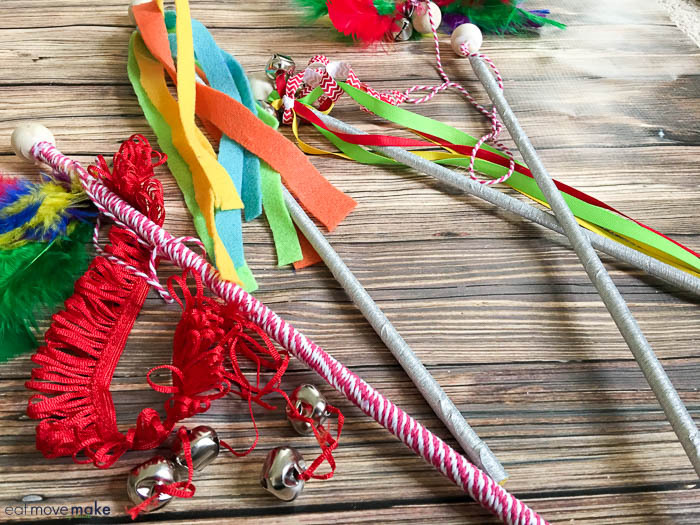 I love this toys because it is so easy my kids could participate in creating some toys. You are so creative! These are great toys for cats! I love it! 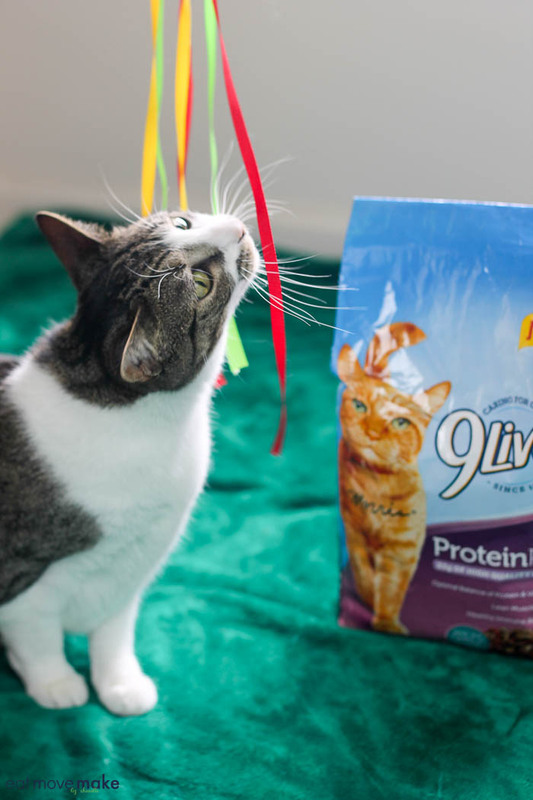 9Lives Protein Plus sounds like a great choice in cat food. I will have to grab some supplies to make some of these toys for my cat. These are too cute. I don’t know if my boys or my kids would enjoy them more. Such a cute cat toy! My cats always loved the toys on sticks like this one. They go crazy for them. 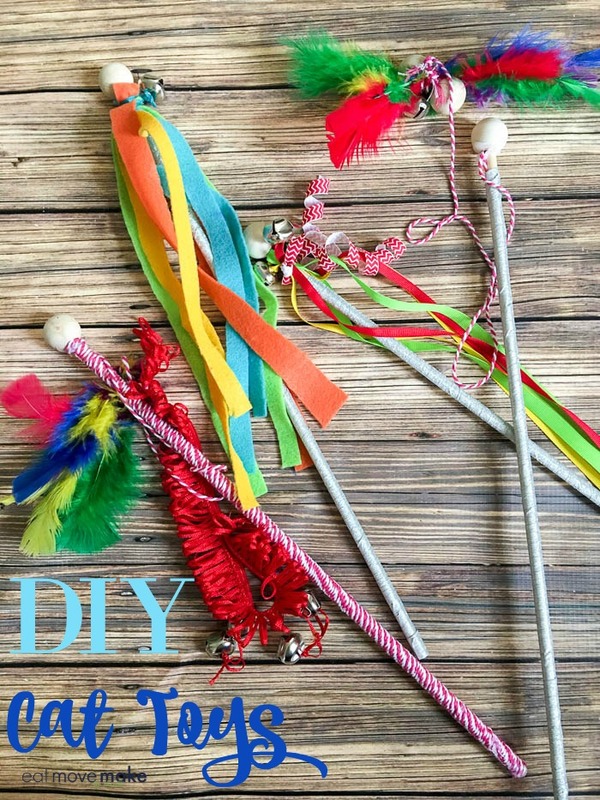 I am going to have to share this post on DIY Cat toys with my daughter. She has a ton of cats at her Dads and loves her pet cats so much. They are super spoiled, so I am certain she will love making these for them! 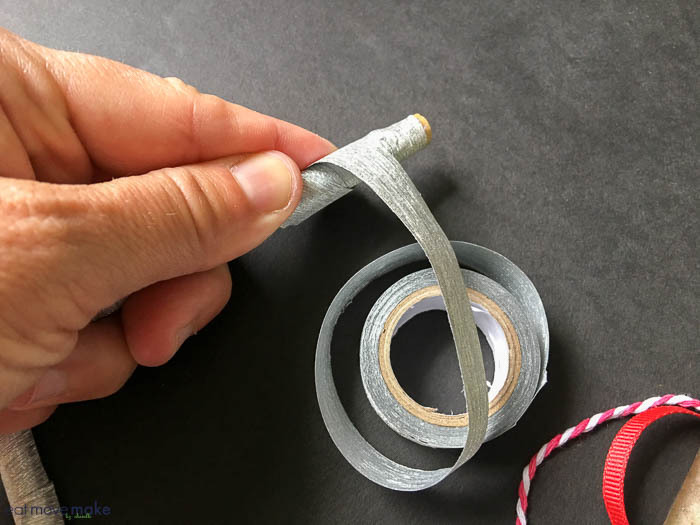 I created a diy cat toy almost exactly like that felt one about a year ago. It’s one of my more popular posts. I would much rather make my own toys for my two cats then buy them. It is more fun that way! What an adorable way to make your own cat toys, I bet kitties everywhere would be happy with these DIY Cat toys! Glad you shared it, will be sharing with my friends. These are all great DIY toys! My daughters best friend just got a new kitten and she was just asking me if we could make a toy for her. This post came at the absolute best time, I will show this to her and we can make a toy for the new kitten. Thank you! We got my daughter a rescue cat when she was 2. They are so close. I am going to do some of these with her tonight. I know she will enjoy making them and playing with the cat. Great idea! Thanks for sharing. This is a great DIY! I love how easy they are, and made with simply materials. Great for younger cat owners too! Your DIY cat toys are super cute and simple to make! My kids have been using some pieces of yarn to play with our two cats recently. Our cats love yarn and ribbons too. These cat toys would be a way better way to play with them! This is the first time I’ve seen DIY cat toys and I love it. Pet toys can be a bit expensive. Pretty neat. This is such a cute idea, my other halves parents have a kitten and she loves playing so I’ll have to send these their way! What an adorable idea! I am always SHOCKED (sticker shock, that is!) by how expensive pet toys are! Shoot, pretty much everything at the pet store is over priced! Love that you made your own, these are super cute! I will do anything that will save me money. I love doing crafts to so put in these two together is really a match made in heaven for me. I do not have any cats but I have friends that do and I think this would be a fun gift to get them. Really doesn’t take much to make some great homemade toys for the cats around our house. 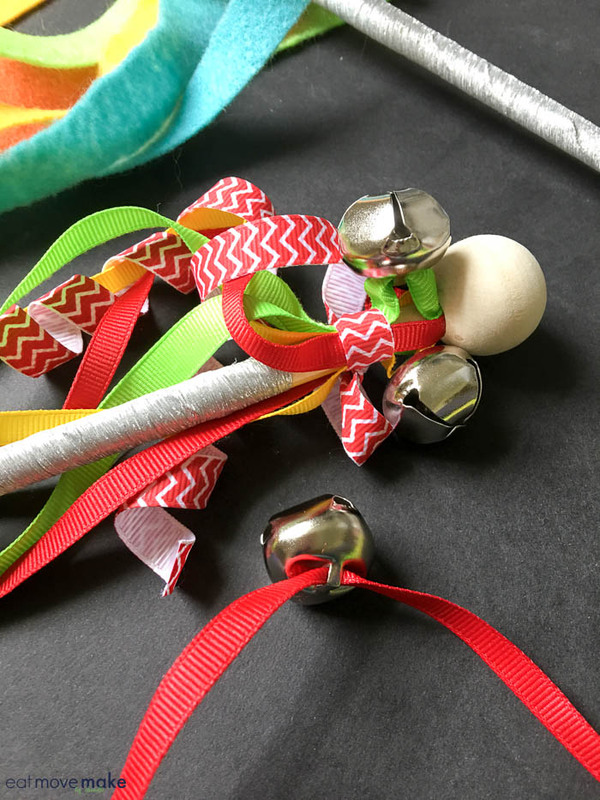 I always have plenty of leftover craft scraps and adding bells always is a winner. I love making DIY pet toys, it’s so rewarding and fun. Great family weekend project. Thanks for sharing the coupon for 9Lives! Those toys are super cute! All it takes to make a cat happy is some fabric and something that jingles! I love it. Oh the things we do for our pets. I have a turtle and I’m going to buy him an extension for his gain to allow more room to swim and sunbathe. 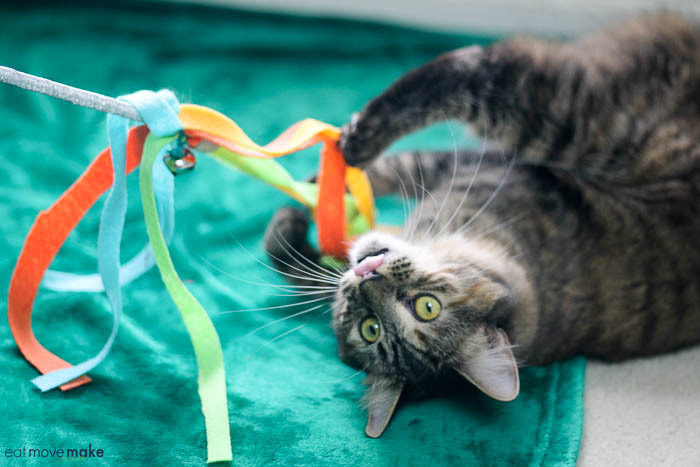 Your cats are so adorable and look like they love their new toys.